Wedding shower invitations, or bridal shower invitations, are traditionally sent to all the female friends and family of the bride by her maid or matron of honor. Other friends and relatives may also host a bridal shower. The wedding shower is thought to have originated as early as the 1890s and is still popular today. Modern weddings now encompass both the women-only events of the past as well as wedding shower invitations for both members of an engaged couple. While many wedding shower invitations still get sent exclusively to women, couples' wedding shower invitations are increasingly popular. Although most people think the wedding shower, or bridal shower, is held to provide the new couple with goods for their new home together, the original wedding showers were designed to provide the materials and financial means for the wedding to take place. Not only have today's wedding showers evolved, so have today's wedding shower invites. 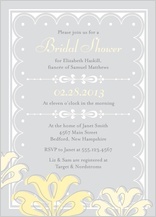 No longer frilly and pastel-colored, today's designs provide unique wedding shower invitations in all kinds of styles. LookLoveSend is one of the leading providers of customized, unique wedding shower invitations. We tap our team of talented artists, who are dedicated to providing fresh, artistic designs in styles that range from traditional to modern. With over 50 designs to choose from, we guarantee you will find wedding shower invitation suitable for your occasion. LookLoveSend makes it easy to customize your wedding shower invitations. Once you choose a design you like, select a font style, color and size, and create your own message. You may also choose to upload an image or photo in certain styles. LookLoveSend allows you to preview your unique wedding shower invitations online before printing. Once you approve your wedding shower invitation, LookLoveSend immediately sends your wedding shower invite to our in-house print team. Our state-of-the-art printing presses and attentive customer service guarantees you a rapid turnaround time. They'll work with you to ensure you are completely satisfied with your wedding shower invites. The perfect wedding shower, or bridal shower, starts with the perfect wedding shower invitation. Let LookLoveSend help you design unique wedding shower invitations that will delight your guests. It will be a keepsake each guest will enjoy. Remember, all LookLoveSend wedding shower invites are printed on premium, high-quality paper and card stock. Whether you need only ten invitations or more than fifty wedding shower invites, LookLoveSend can provide you with simple, worry-free ordering. 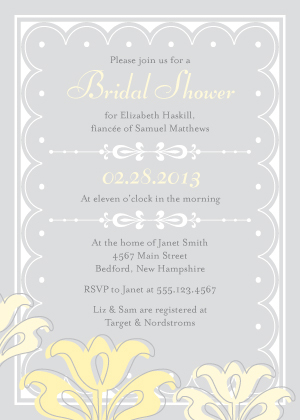 Start your shower off with a unique wedding shower invitation from LookLoveSend.